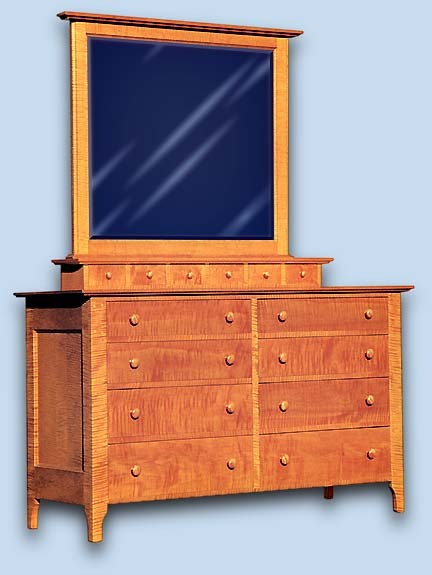 The straight simple lines of this classic Shaker design Lowboy Dresser are modified by the addition of a mirror, which is optional. This lowboy dresser is shown in lightly figured solid curly maple, the chest of drawers features all dovetail design drawers,	eight in the base section with six small jewelry drawers above. The	dimensions are 60" long, 40" high, and 20 1/2" deep. The mirror is 44" long and 38" high. Total height with mirror is 78". We offer a wide selection of dressers in many varying styles, and will build to any special needs design requested. Our low boy dressers are available in all woods to grace any bedroom.